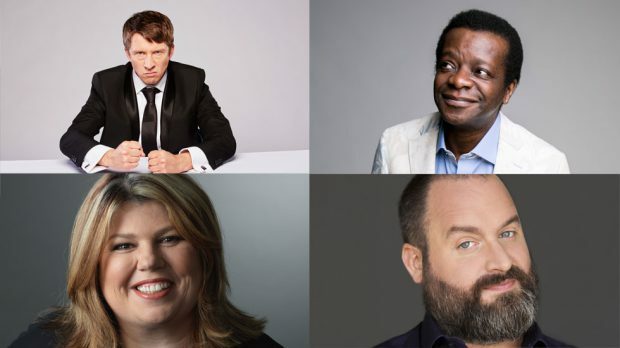 The Perth Comedy Festival 2018 returns April 23 – May 20 with UK favourite Stephen K Amos again leading the 10 comical acts confirmed so far, also including Urzila Carlson (RSA/NZ), Des Bishop (IRE), Jason Byrne (IRE), Daniel Sloss (SCO), Tom Segura (USA), Jonathan Pie (UK) and Aussie’s Nazeem Hussain, Neel Kolhatkar and Alex Williamson. More acts will be announced at the end of November with the full line-up revealed in March 2018. Comic maestro Stephen K Amos is returning to P-town with his Bread and Circuses show which covers everything from Brexit to Trump. South African born New Zealander Urzila Carlson’s Studies Have Shown will guarantee audiences are about to learn something rather useless and ridiculous. Irish-American comedian Des Bishop and fellow Irish funny man Jason Byrne are also booked to return to the west. Bishop’s Egorithm is an open and honest, fast paced hour of stand-up delving into a myriad of topical matters including male defensiveness around feminism and Islamophobia. Byrne’s The Man With Three Brains is a brand new show where his left brain scans the audience looking for improv moments, his right brain collates stand-up material and stunts and his centre brain acts as his coach pushing him to the limit. The festival also welcomes with open arms the return of one of Scotland’s fastest rising stars, Daniel Sloss. With his endearing blend of arrogance and awkwardness, the critically acclaimed Sloss will have audiences in stitches with his brand new show: Now. American stand-up comedian and actor Tom Segura brings his new live show No Teeth No Entry to the festival. His national tour of Australia comes off the back of the success of Netflix specials and his popular podcast Your Mum’s House, which is co-presented with his wife. Triple J’s Nazeem Hussain is back on home soil with No Pain No Hussain! This follows live performances in London, Edinburgh and China, as well as a few weeks in the depths of the African jungle on I’m A Celebrity Get Me Out Of Here! Fellow Aussie’s Neel Kolhatkar and Alex Williamson will bring some of their best new material to the festival. Since skyrocketing to internet stardom a few years ago and subsequently earning over a million followers world-wide, Kolhatkar has continued to build and impressive live following. His 2017 season culminated in a sell-out show to thousands at Sydney’s iconic Enmore Theatre and this new stage show Neel Kolhatkar Live sees him pairing some of his greatest old material with plenty of never before seen/heard jokes. Williamson’s So Wrong, It’s Wrong takes a twisted view and promises to shake your faith in humanity at times, before restoring it ever so slightly, then smashing it again beyond repair before the show is over. And, rounding out this first announcement is UK satirical news reporter Jonathan Pie who became an internet sensation for his ‘off-air’, foul-mouthed tirades against the hypocrisy of world politics and entertainment. See his hilarious YouTube channel for all the evidence you’ll need to agree that his first ever Perth show is one not to be missed. The Perth Comedy Festival 2018 returns April 23 – May 20 in various venues. Tickets on sale 10am Friday, November 10. Announcing our first 10 acts for the 2018 Festival! Welcoming some new faces alongside your Festival faves. See the full list at www.perthcomedyfestival.com ON SALE from 10am, Friday 10 November.Exclusive Optus Perks pre-sale from 10am, Monday 6 November via www.optusperks.com.au or 'Perks' in the My Optus app.